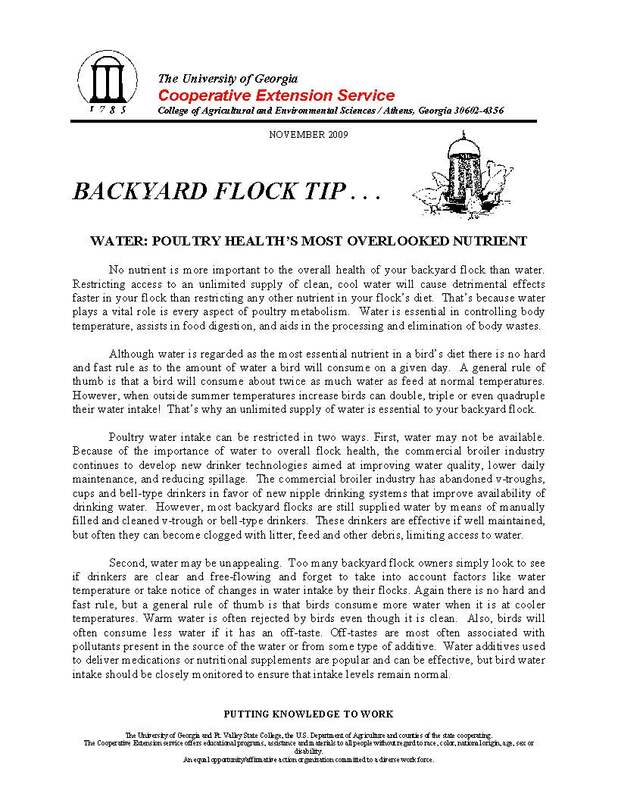 No nutrient is more important to the overall health of your backyard flock than water. Restricting access to an unlimited supply of clean, cool water will cause detrimental effects faster in your flock than restricting any other nutrient in your flock’s diet. That’s because water plays a vital role is every aspect of poultry metabolism. Water is essential in controlling body temperature, assists in food digestion, and aids in the processing and elimination of body wastes. Although water is regarded as the most essential nutrient in a bird’s diet there is no hard and fast rule as to the amount of water a bird will consume on a given day. A general rule of thumb is that a bird will consume about twice as much water as feed at normal temperatures. However, when outside summer temperatures increase birds can double, triple or even quadruple their water intake! That’s why an unlimited supply of water is essential to your backyard flock.